Poker Alice (1851 - 1930), was a famous poker player in the American West. She stood out not only as one of the earliest women poker players, but also as one of the most well-known Old West gamblers. 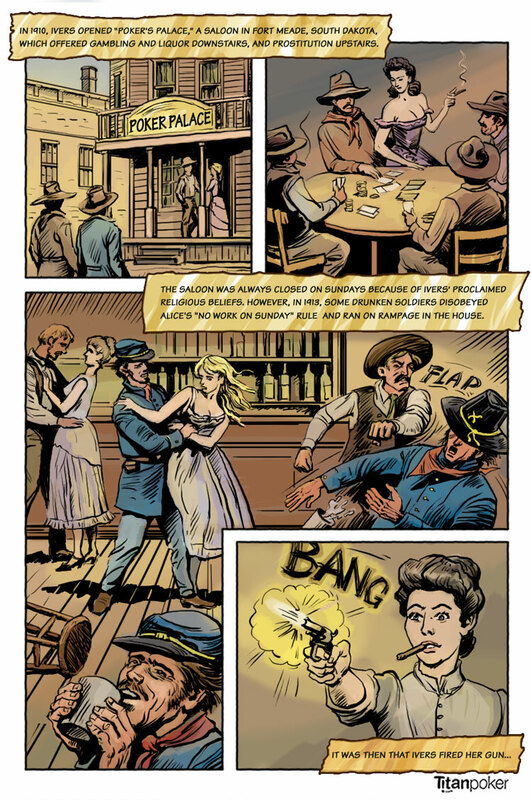 In fact, of all the Old West women to make their mark in history, Poker Alice was respected as an honest, hard-working businesswoman who didn't hesitate to defend her family and business interests. 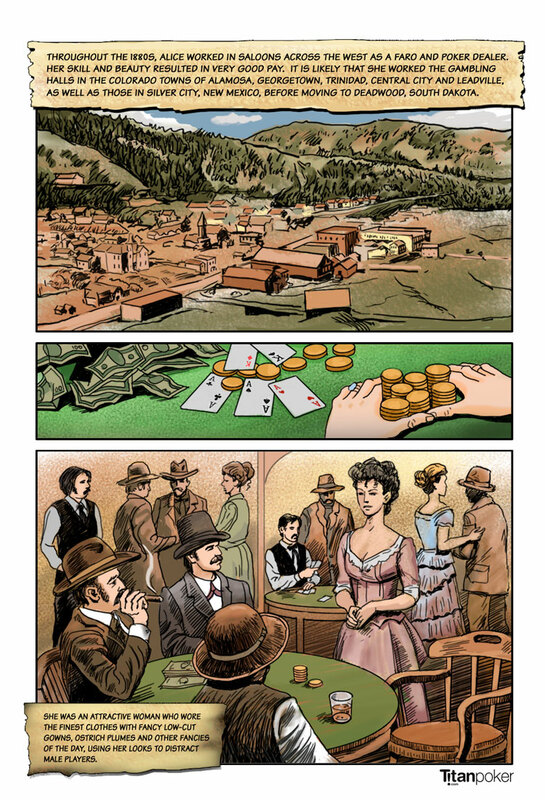 In the pages below, talented illustrator Jack Tzekov brings color to Poker Alice's amazing story. 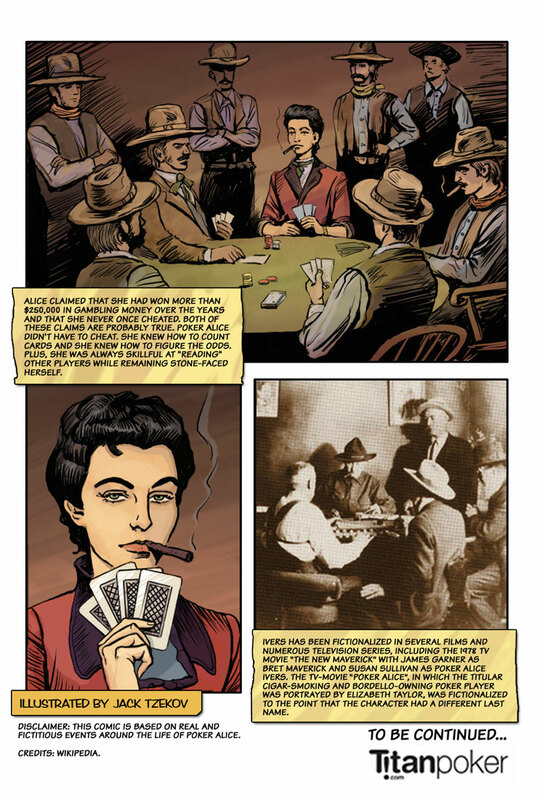 This poker comic is based on real and fictitious events around the life and legend of a fascinating person. 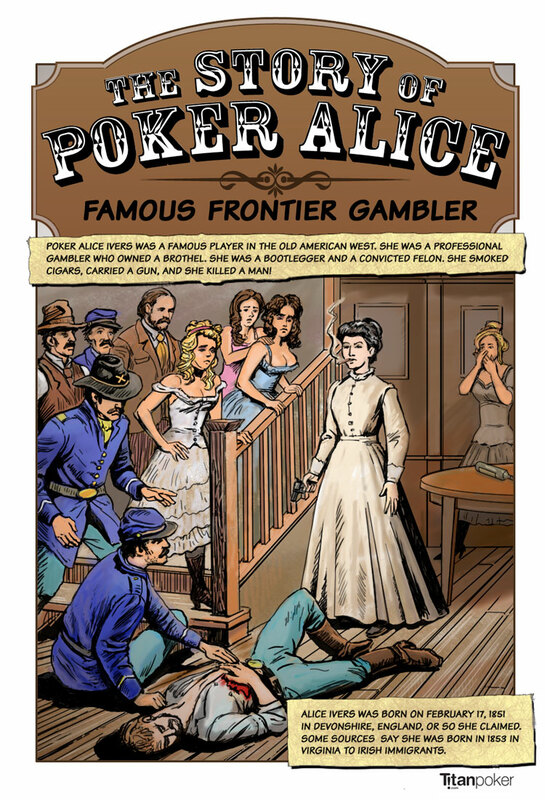 Poker Alice made a mark on card game history and established herself as a famous Old West woman. Download The Story of Poker Alice in PDF format. A game of three-card Monte, sir, a round of Five and One? Music and lyrics by California resident, Larry Potts (larrypottsmusic.com), who has won considerable acclaim by winning and placing in numerous songwriting competitions. Poker Alice Ivers was a famous player in the old American West. She was a professional gambler who owned a brothel. 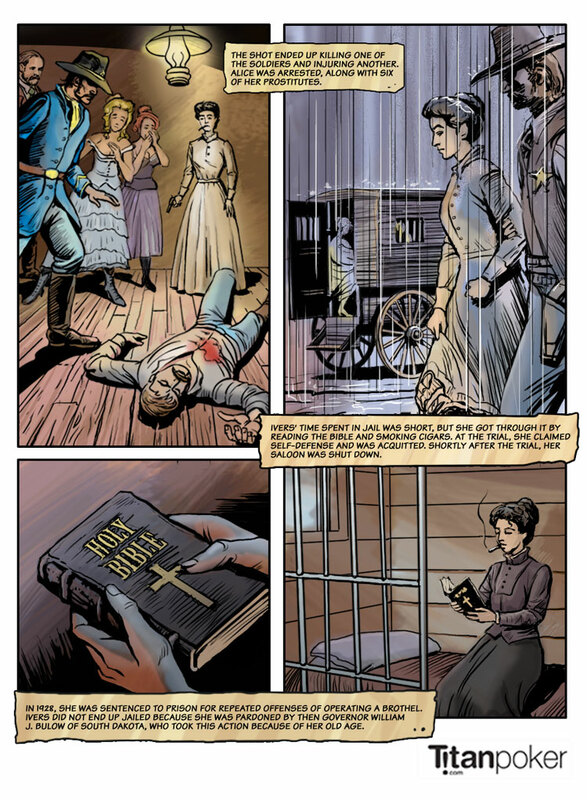 She was a bootlegger and a convicted felon. She smoke cigars, carried a gun, and she killed a man! Alice Ivers was born on February 17, 1851 in Devonshire, England, or so she claimed. Some sources say she was born in 1853 in Virginia to Irish immigrants. While in her late teens, Alice's family moved to Leadville, Colorado. There she met and married Frank Duffield, sometime in the 1870s. Duffield was a mining engineer who played poker in his spare time. He taught Alice how to play the game and she found that she had a good head for counting cards and figuring odds. Most women only played poker at home at the time. Alice accompanied her husband to the gambling parlors and soon started sitting in on the games. 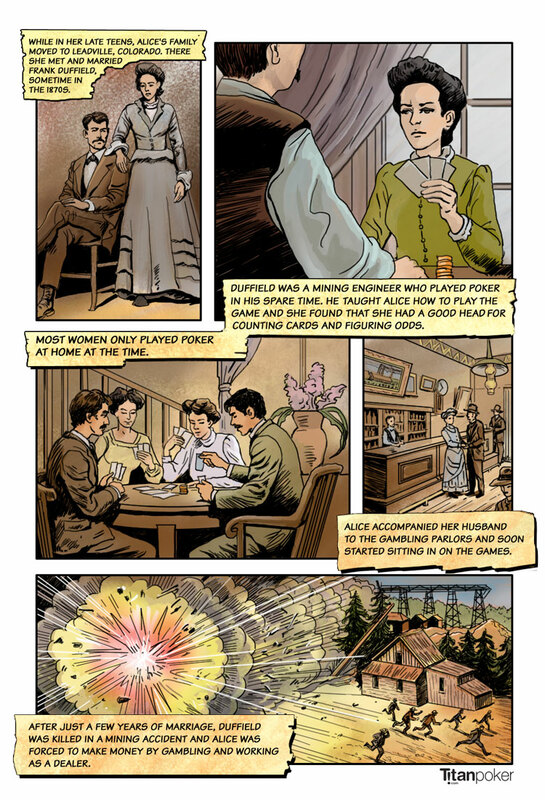 After just a few years of marriage, Duffield was killed in a mining accident and Alice was forced to make money by gambling and working as a dealer. Throughout the 1880s, Alice worked in saloons across the west as a faro and poker dealer. Her skill and beauty resulted in very good pay. It is likely that she worked the gambling halls in the Colorado towns of Alamosa, Georgetown, Trinidad, Central City and Leadville, as wells as those in Silver City, New Mexico, before moving to Deadwood, South Dakota. She was an attractive woman who wore the finest clothes with fancy low-cut gowns, ostrich plumes and other fancies of the day, using her looks to distract male players. During this time, Alice was reputed to have made as much as $6,000 at the gambling tables on a good night - a huge amount of money back then. 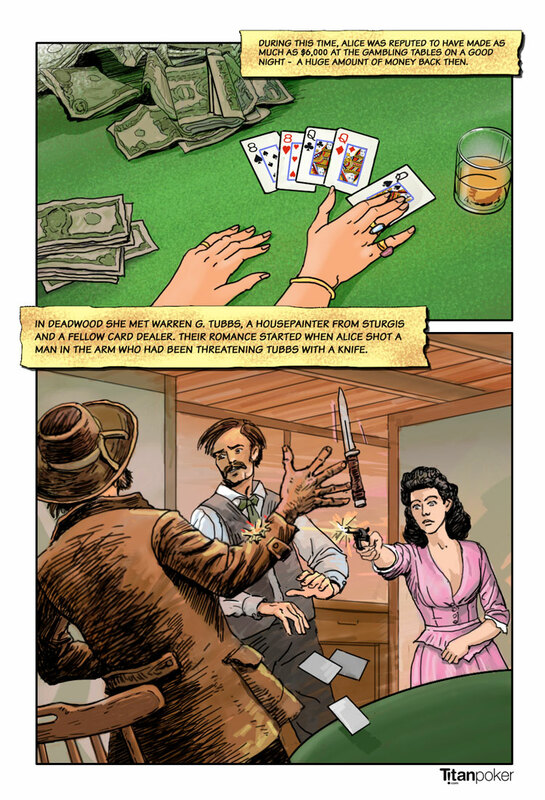 In Deadwood she met Warren G. Tubbs, a housepainter from Sturgis and a fellow card dealer. Their romance started when Alice shot a man in the arm who had been threatening Tubbs with a knife. Alice Ivers and Warren Tubbs married and had four sons and three daughters together. While her children were growing up, Alice tried to keep them away from the gambling houses and at one point she and Tubbs decided to homestead a ranch northeast of Sturgis on the Moreau River. 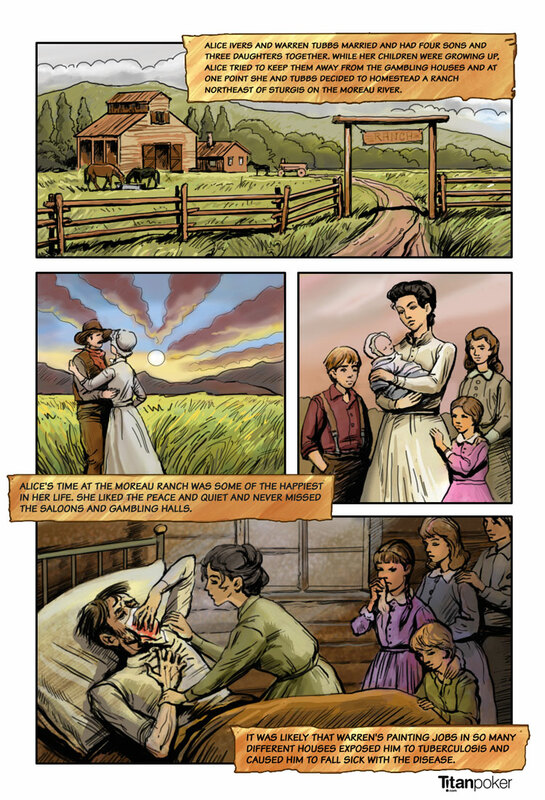 Alice's time at the Moreau Ranch was some of the happiest in her life. She liked the peace and quiet and never missed the saloons and gambling halls. It was likely that Warren's painting jobs in so many different houses exposed him to tuberculosis and caused him to fall sick with the disease. Warren Tubbs died in 1910 of pneumonia during a blizzard. To pay for his funeral, Alice had to pawn her wedding ring, which led her back to the poker tables. She took his body back to Sturgis for burial. 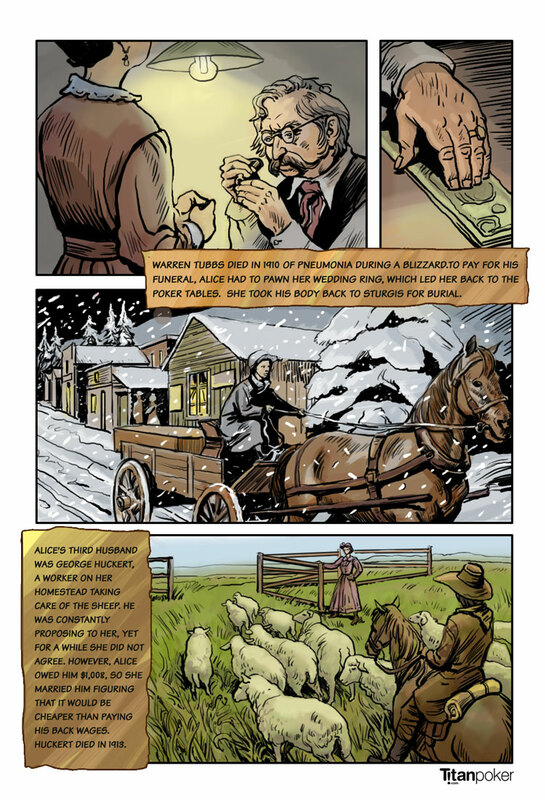 Alice's third husband was George Huckert, a worker on her homestead taking care of the sheep. He was constantly proposing to her, yet for awhile she did not agree. However, Alice owed him $1,008, so she married him figuring that it would be cheaper than paying his back wages. Huckert died in 1913. In 1910, Ivers opened "Poker's Palace," a saloon in Fort Meade, South Dakota which offered gambling and liquor downstairs, and prostitution upstairs. The saloon was always closed on Sundays because of Ivers' proclaimed religious beliefs, however, in 1913, some drunken soldiers disobeyed Alice's "no work on Sunday" rule and ran on rampage in the house. It was then that Ivers fired her gun. The shot ended up killing one of the soldiers and injuring another. Alice was arrested, along with six of her prostitutes. Ivers' time spent in jail was short, but she got through it by reading the bible and smoking cigars. At the trial, she claimed self-defense and was acquitted. Shortly after the trial, her saloon was shut down. In 1928, she was sentenced to prison for repeated offenses of operating a brother. Ivers did not up jailed because she was pardoned by then governor William J. Bulow of South Dakota, who took this action because of her old age. Alice claimed that she had won more than $250,000 in gambling money over the years and that she never once cheated. Both of these claims are probably true. Poker Alice didn't have to cheat. She knew how to count cards and she knew how to figure the odds. Plus, she was always skillful at "reading" other players while remaining stone-faced herself. Ivers has been fictionalized in several films and numerous television series, including the 1978 TV movie "The New Maverick" with James Garner as Bret Maverick and Susan Sullivan as Poker Alice Ivers. The TV movie "Poker Alice," in which the titular cigar-smoking and bordello-owning poker player was portrayed by Elizabeth Taylor, was fictionalized to the point that the character had a different last name. Jack Tzekov is an art director, graphic and web designer and illustrator who works at Bearbrook Studios. He atttends the Academy of Art University and lives in Ottawa, Canada.